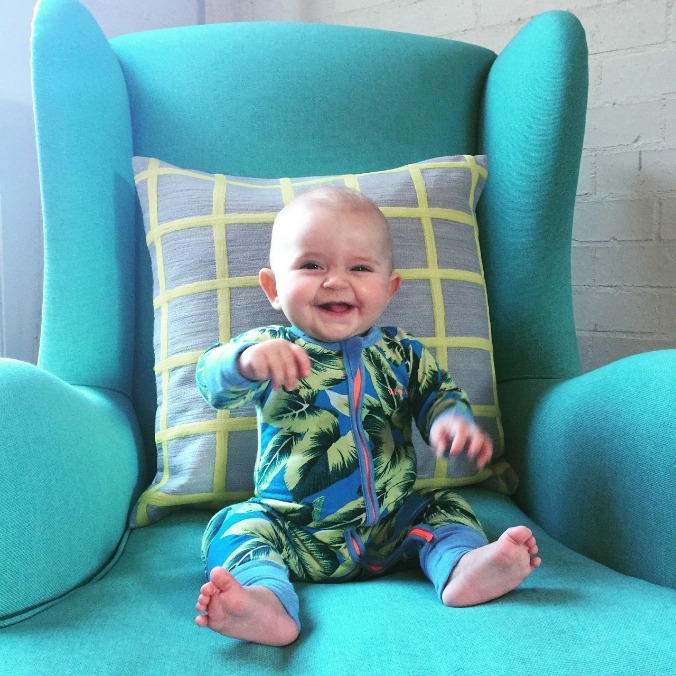 So this week I took a photo of Mags in an arm chair this week as I often do. This time she was even more thrilled with herself because she can now sit up all by herself! Well, she sometimes just gets the leans and face plants but mostly she is good to go! Why yes, she is winking at me. As I said, loving herself sick. Another Mum took a photo of her daughter in a chair this week too. Not sure if you saw it? 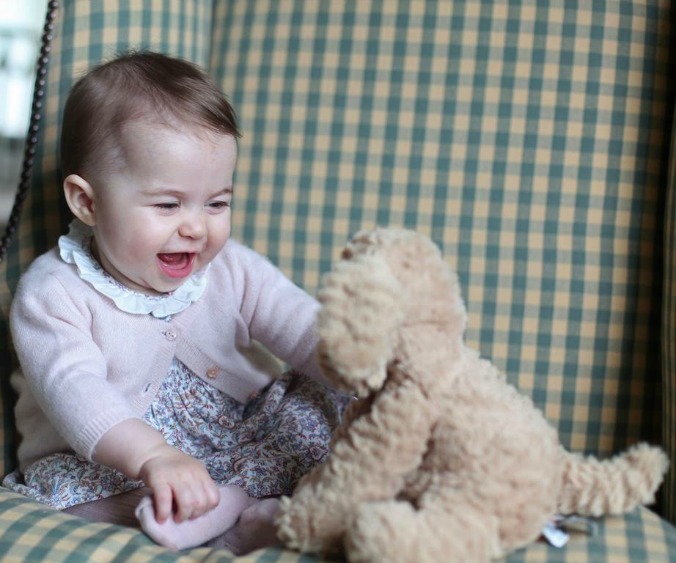 That’s right, Kate has snapped a couple of snaps of Charlotte to share with us all. YAY! Complete with mini pink cashmere cardigan nonetheless! Had I been wearing pearls, I would have been clutching them. Seems I’m not the only one who can’t stop taking snaps of cute little 6 month old ladies. 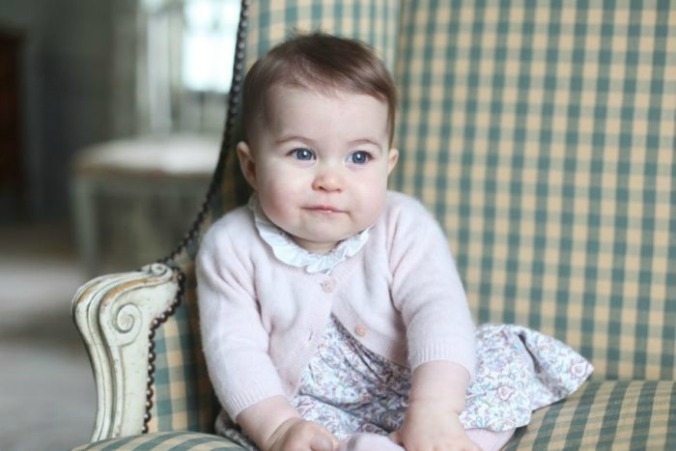 There was much talk about how good they were, how Kate is getting better at taking portraits, about how you can see the reflection of lights in Charlotte’s eyes which mean that she is getting very profess at it all. In any case, it was a delight to see the little one and her superior hair which she obviously takes after the mother. Poor Mags, I currently am sporting a number 2, what hope does she have?! For now it’s me and my iPhone and a good Instagram filter. Those lights will have to wait. Speaking of Instagram, did you see that people have been naming their children after Instagram filters?! I’ll let that sit with you for a moment. Lux was up 75% and Ludwig, Amaro, Reyes, Hudson and Kelvin also increased in popularity for boy names in 2015. Between this and the increase in Game of Thrones names, I think it’s time we bring back Mavis and Barry. Speaking of old school names, our friend Frank has a new favourite spot in the house. He’s not stupid. He’s managing to get all kinds of treats from this new spot and is developing a fierce love for sourdough with Lurpak and Vegemite. Don’t we all mate, don’t we all? 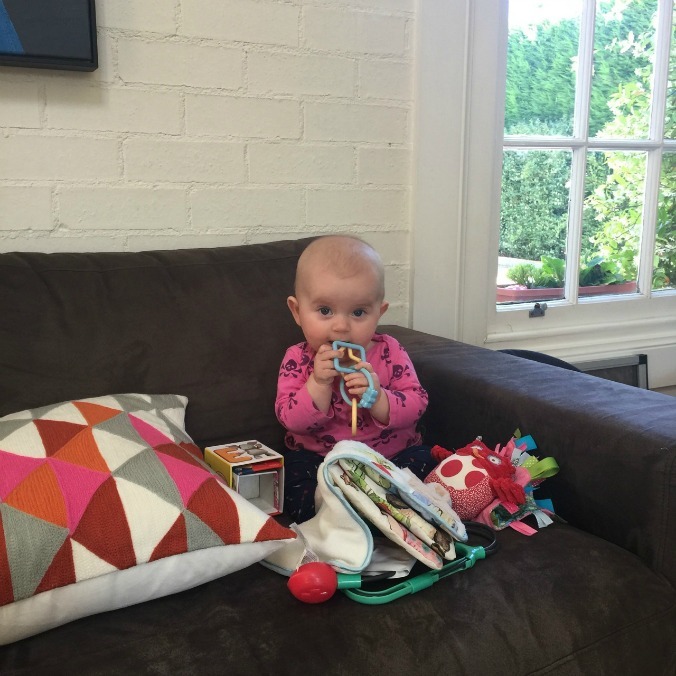 I’ve had a few people ask me about how to go about starting solids and what I have done with Maggie. Well, I must say that I am pretty clueless with it all (even though it’s my third time at it) with a mixture of a kind of baby led wearing approach with some pureed stuff too. Where I have been heading people to is my friend Emma’s blog. 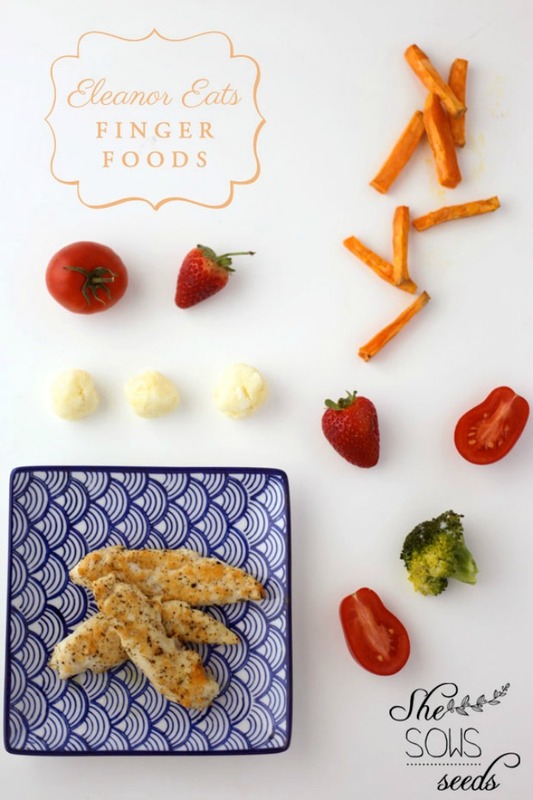 This post in particular gives some good ideas of what to feed babies when they are starting out with finger food. I must say that Maggie has taken to eating with GUSTO (just like her sisters and Mum) and will try pretty much everything. For breakfast she will eat some toast and I will make her some porridge which I shovel into her mouth in between fists of sourdough go in. Lunch it’s some bread with avocado or banana and some pureed fruit or yoghurt and for dinner it’s usually what we are eating too, just smaller. This morning she had her first boiled egg – texture doesn’t seem to be a problem (as it was with gagsville Harps) and I hope she keeps it up! I saw this video last week which made me laugh. If kids were in charge of buying their parents alcohol. Know what’s also good? When you see the same item of clothing go through all your children. This top got a run this week on Mags. Nothing fancy, just something I picked up from Cotton on Kids back in 2007. Here it is on Daisy, back in the day! Oh Rob, so youthful. I also saw that it had Harper’s name written on the label which means that she must have worn it to daycare! SO LITTLE. I can’t believe looking back now that both girls were in day care from about 7 in the morning till 5.30pm at night a couple of dates a week each from 5 months. 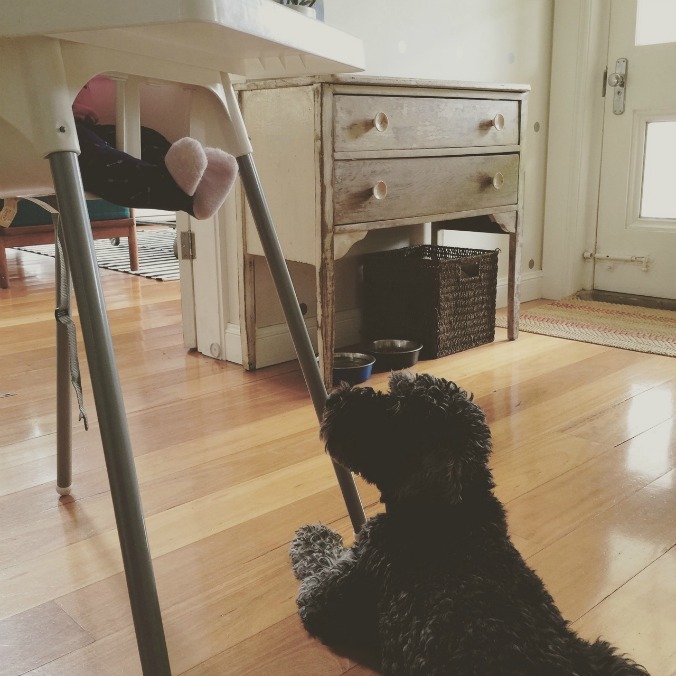 I can’t imagine dropping Maggie anywhere…I mean she’s still being breastfed whenever she wants to…I am feeling very lucky that we are getting to have all this time together at home this time round. What are you up to this weekend? We are going to be Christmas decorating tomorrow…I can’t believe that it’s the 4th December and there’s no sign of Christmas in our house! NOT OK. I bet Kate has the halls all decked with boughs of holly. And then on Sunday we have a lunch for my brother’s birthday at my Mum’s place down here (they are slowly moving in over the next month). I’ve started to get a sore throat which I am really hoping pisses off as I am NOT interested in being sick. We’ve done enough of that this week with Harps anyway. How many photos of your babe are on your iPhone at the moment? 2357? 7865? What’s your favourite Instagram filter? Would it make it to your kids name? Got any other blogs or ideas for feeding babies? Hope you all have a great weekend! Here’s to Christmas decorations and NOT getting sick! Maggie is 4 months old! The Baby Files #3 Baby Files #4 Maggie is 10 months old! That video GOLD! And yes to Lurpak and Vegemite, it’s what half of my muffin top is made of! She gets cuter every day Beth.Valencia, always. So the silly hat thing goes way back then. That Finnish vid is hilarious! I know a baby Hudson and I think he’s named for the river in New York. Not the Instagram filter. I’m a Juno and Ludwig fan! Just the idea of that video being a reality made me twitch ? Miss Maggie Mac is still making ovaries explode all over Australia with her gorgeous grin. Ha! She sure is Kim. The video is great! Aww she is just gorgeous! We will be completing our decorations this weekend. We tend to go a bit overboard with lights, but the kids love it and secretly I know Mr B does too. It’s the best when it’s all done! 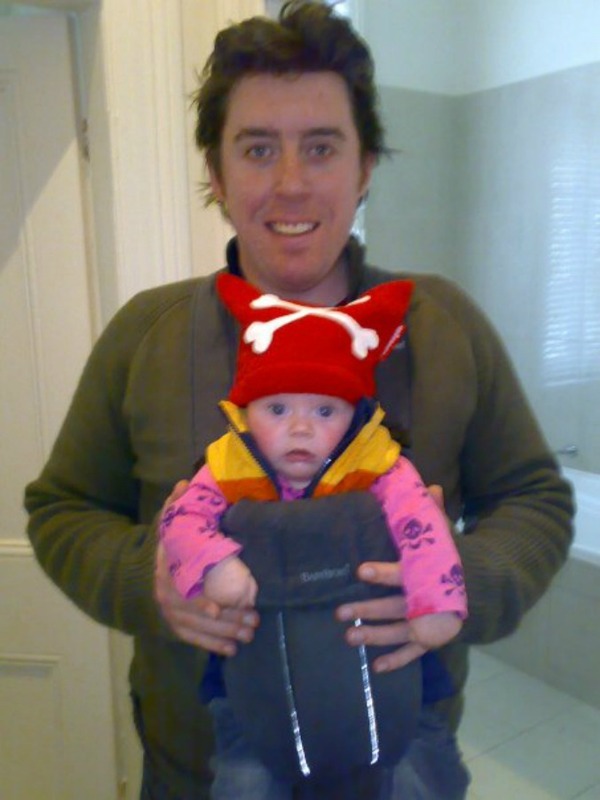 My daughter signed up to Tinybeans which is a free online photo sharing app and you choose who sees it. (family, overseas friends etc) Madeleine is 16 months old and we have a photo for nearly every day of her life so far. It’s really good and I look forward to getting it. She is also a good eater, will try anything. She started on pureed vegetables. Loves the cherry tomatoes cut up a bit and sliced cheese, bananas, mandarins and adult food cut up small. Loves potatoes. Still enjoys the organic pouches (vegetables and risottos) if she is hungry and dinner is not ready. I can’t eat bread anymore but keep buying Lurpak when it is on special, I have 6 in the freezer! The Christmas tree went up yesterday. Can’t believe how fast the year has gone. I like some of the filter names, Willow in particular. Very good reporting here Poppy – love it! It’s been a while for us but the One Handed Cooks blog was like my bible! Every time I buy a tub of Lurpak I think of you instantly! I was never a consumer, such is your power of persuasion. Ha! If only I could be their brand ambassador! I have some stuff about baby led weaning on my blog! We had a great time with solids with our daughter. I’m too lazy to make puréed food and I loved all the learning she was doing. I did go through phases of wishing she was spoon fed but she wouldn’t have a bar of it! Little miss independent! I’ll check out your blog thanks Ruth! they wear their hearts on their sleeves! I know nothing about apps! Babies are the very best thing in the whole world. Mine is growing too quickly! Hmmm my favourite at the moment is “gingham” so maybe not… But that’s also because I don’t have time to look at them all. Speaking of feeding whenever they want, any hot tips on what to where while boobing in this warmer weather? Bohemian Traders have some good frocks that will do the trick. Also check out Jodi’s blog Practising Simplicity as she has been doing a series on BF friendly clothes. Oh thanks so much for the shout out! I’m glad I’m of some use to somebody, somewhere (often it seems I’m just rabbiting on to myself and I wonder who really cares about what my kid is eating?!) With two older hungry girls I’m sure meal time is a different scenario in your house, but the adjustment to having another mouth to feed other than our own has been different for us. Eleanor still isn’t really eating dinner with us, mainly because she has it at like 5.30-6 and Matt’s never home before 6.30-7. I follow a lot of great Instagram accounts which have great baby/toddler food ideas and inspiration – the.toddler.ingredient, mylovelylittlelunchbox, yumboxlunch, sylina_lunches, lapetitefoodie, littlemashies, jacobs_food_diaries, bitesfortots, cleanandgreen_kids, babygurunutrition, cookingofrbusymums, blw_meal_ideas, babyledgourmet, amieeats. And if all else fails just search #eleanoreats on Instagram and see what I’m shoving in my chubby blossom’s face at any given time! Happy chow time Miss Maggie, get into it! Oh and we have a NAKED Christmas tree currently as husband away and wants to help decorate. This just won’t do. And Eleanor and I have both been struck down with horrible head cold lurgy – PISS OFF! There are currently 3,965 photos on my camera roll…of which 3,960 are of my child. I know a little Juno, and a few Hudson’s, a Willow, and a friend considered Lark for her girl! I have over 6000 on my photo roll!